In this book, Whitehead argues against the fact-minded orientation of education and the practice of science. It is not that facts are unhelpful, but they have become a substitute for learning (learning is now tantamount to fact memorization). This change handicaps students by eliminating the possibility of creativity, curiosity, and critical thinking; it handicaps science by limiting the kinds of questions that can be asked and where to look for answers; and ultimately puts people out of touch with their experience. The problem is fact-mindedness. Facts are the relics of enlightenment thinking. They represent unbiased and unquestionable truth about our universe. The more you collect, the more you know; the more you know, the more powerful you are; the more powerful you are…. You get the picture. It is a familiar theme from the middle of this past century, and has been described by contemporary physicists, theoretical biologists, continental philosophers, humanistic psychologists, learner-centered teachers, among many, many others. Unfortunately, college students are seldom exposed to these ideas, and have to wait until they reach graduate school before they wonder if their learning experience may have been different. The goal is to make those ideas accessible here by translating the cumbersome, obscure, and turgid expression of these ideas into twenty-first century examples that are more applicable and meaningful for undergraduates and the educated public. It is argued that judgment must always be applied to matters of fact. That is to say, the fact is not the end of the story. That gravity compels bodies does not substantiate itself: it is a way of describing the relationships between bodies. Gravity helps us better understand physical relationships, but by itself and outside of any meaningful context that fact of gravity is useless. Patrick Whitehead explores the tendency of our educational systems to replace experience with facts about experience. This so-called “education” emphasizes a rather naïve acquiescence to the sovereignty of facts. It privileges the mechanical act of fact-finding and answer-giving over the spontaneity of curiosity, creativity, and resultant insight.... Whitehead thus asks us to think beyond a simple fact-versus-falsity approach to the process of becoming an educated person. Patrick challenges us to question and examine our quest for certainty through our use of objective facts over other more soulful ways of knowing. 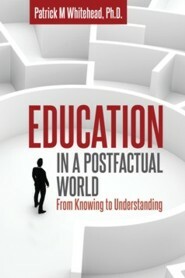 Whitehead’s Education in a Postfactual World is a disruptive analysis of education and learning made accessible and personal.... Delightful in approach, easy to follow, convincing through example, Education in a Postfactual World unearths roots to some of the current social commotion, offers reasoned transformations, and encouragement for action. Patrick’s writing explores and intelligently explains the most important questions about being human. Such a brave foray into complex yet fundamental thoughts/assumptions, articulating them with a simple language that only one who understands them well can do. I am thrilled this book is written and I wish we all got to engage in the thoughts presented in this book. Not as consumers but as thinking and wondering beings. Whitehead has the rare talent of conveying potentially dense and abstract concepts in a clear, interesting, and engaging manner. He eloquently leads the reader from knowing to understanding, using both the content and the process of the book to illustrate his argument.... An important, timely, and well-written book! Patrick is an assistant professor of psychology, and author of Psychologizing: A Personal, Practice-based approach to Psychology. He has published widely in peer-reviewed journals of higher education, psychology, philosophy, biology, and sports; and belongs to the American Psychological Association, the Interdisciplinary Coalition of North American Phenomenologists, the Association for Humanistic Psychology, among others.